The Audison team opens the door to the future of audio reproduction; Audison Full DA 24 bit/96kHz. This new technology provides Full Digital Audiosignal transfer from the head unit, through the DSP into the amplifiers, all in a high resolution 24 bit/96kHz format. We are now free from the limitations and signal alterations of a traditional analogue system at the standard resolution (16bits/44.1kHz). With the innovative Full DA 24 bit/96kHztechnology, the audio data, from a DVD-A disc or from a high resolution audio file (WAV, FLAC,…. ), is sent from the head unit in a digital format to the input of the Audison BIT ONE*. Here the signal is optimized with the powerful on-board DSP before it is sent, still in a high resolution digital format, to the Audison Thesis or all new Audison Voce amplifiers via the proprietary Audison AD Link system. The conversion from analogue into the digital domain occurs at the first stage of the amplifier. This process is entrusted to 24 bit/192kHz D/A converters, ensuring exceptional audio performance. It is only after this extremely accurate digital transfer and conversion that the signal is amplified by the Audison A and/or AB Class circuitries, renowned for their musical detail and warmth. Come and experience the unveiling of a new frontier in audio reproduction! Audison Full DA 24bit/96kHztechnology, along with the new Audison Voce amplifiers will make their world-wide debut during the 2011 CES in Las Vegas from January 6th to 8th 2011. Be sure to visit us in “SALON A” of the “Orleans Hotel & Casino”. A system based on Full DA 24 bit/96kHz technology will equip a demonstration vehicle. The vehicle will feature: the Audison 24 bit/96kHz BIT ONE*, the Audison AV 5.1k amplifier and a complete Audison Voce speaker system. 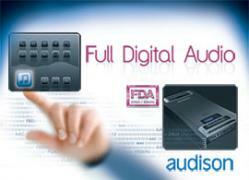 Feel the difference, the Audison Full DA 24 bit/96kHz!